Where I am at on my DNA Projects? 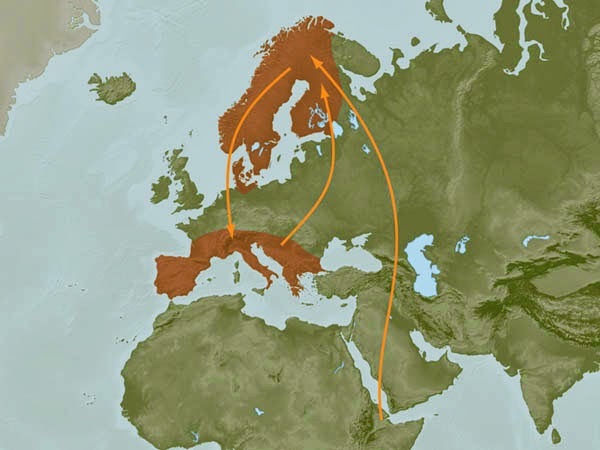 I began my DNA based research with Ancestry.Com’s Y-DNA. Initially, I was disappointed because the closest match to me was one where our Most Recent Common Ancestor (MRCA) was ten generations away. He had his tree going back seven generations, not quite enough. Sigh. After several months another person matched with me. This time our MRCA was supposedly only three generations away. Very cool. This was a line I could possibly follow. I figured, If I could follow his tree up the seven generations that he had and then followed all of the male descendants down, I might find one that was in the right place at the right time to be my paternal father. I’ve gone up four or five generations and followed all of the male descendants; I still haven’t figured a potential candidate. That is to say no one at the right place at the right time. Then I was talking to a friend is is extremely knowledgable about DNA testing and results. He was telling me that the person I was looking at might be much further away. He and I matched 30 of 30 overlapping markers. I had taken a Y-46 marker test and he had taken a Y-33 marker test. My friend indicated he has seen many cases where 30-40 markers were matched up fine but when the test was expanded to more markers the matches fell apart and the MRCA jumped much higher. I will need to see if my close match there will take an expanded test (even if I pay for it). Of course my wife couldn’t supply a Y-DNA sample. So far, we have had one of our biggest brick walls on her paternal side. I had really hoped that DNA could open a gap. We asked one of her her brothers to help and he supplied the sample. Of course, we had to explain our actions and desires several times to my wife’s mother who thought we were in some way suggesting she had slept with the milkman or some such thing. On my brother-in-law’s test we had an immediate hit on Ancestry. 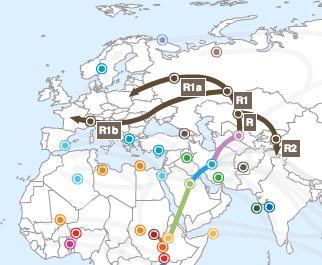 All the markers but one matched and Ancestry suggested a MRCA at six generations. We only have four generations on my wife’s paternal line. 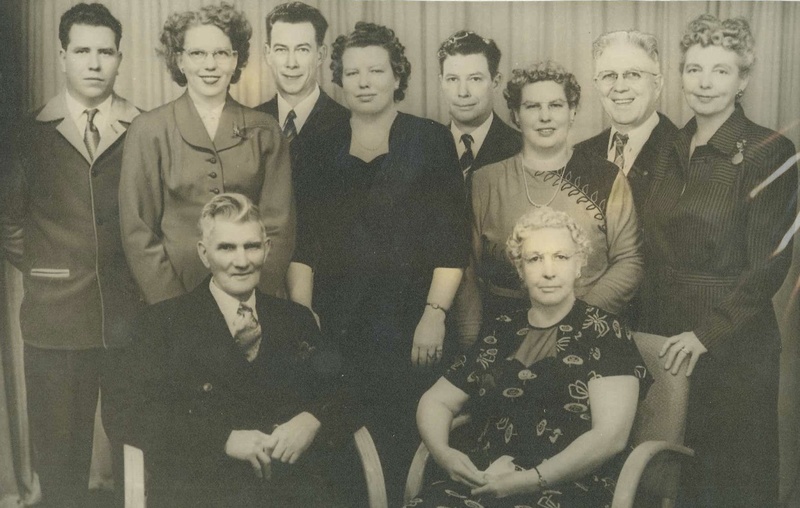 The potential matching cousin has seven generations identified on his paternal side. So, if we can’t trace up to his tree, possibly we can trace down from his tree to a common ancestor. I have a lot of work to do to do that tracing and see if I can trace from his top person back down to find my wife’s ancestor. I used my Ancestry Y-DNA test results and purchased a transfer kit from my.familyTreeDNA.com to transfer my results to their system. I have not had any new matches or other contacts on my Y-DNA. It seems like no one is doing the Y-DNA test any longer, or at least it appears to have dropped significantly in favor of autosomal DNA testing. 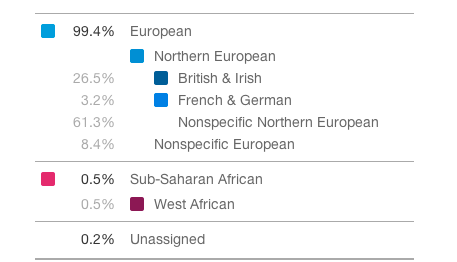 I was part of the Beta testing for Ancestry.Com’s autosomal testing. The “ethnicity estimate” didn’t have any surprises. I’ve received quite a few “matches” on Ancestry, but they don’t tell you how or where the match occurred. All my matches there have been “possible range 4th to 6th cousins and nothing of significance has been found there. I was attending a Genealogy Special Interest Group meeting of the Genealogy Society of Cobb County Georgia and was talking with the resident DNA Expert. He suggested that I do autosomal testing of both myself and my mother, who is still living. I thought to myself, “Duh” or maybe I actually used my out loud voice. In any event, have both myself and my mother’s DNA in the same system would conclusively prove a connection went through her or through my unknown father. If a person matches on me and my mother, the linkage must be through her. If a person matches on me and NOT my mother, the connection must be through my unknown father. After that initial success frustration again. The next three matches matched against me and not my mother, so I knew they were matches against my unknown father. I contacted them and no responses. It is really frustrating when there is no response from people. I learned about another service that is free called GEDMatch.com. It is a very cool site and it is free. They give instructions on how to export your autosomal DNA test results from Ancestry.Com, Family Tree DNA, and 23&Me and import the results into their system. Their system is agonizingly slow as they take a few weeks to process your data and then eventually it is populated into their system. As I mentioned, it is free, so you really can’t complain about the speed. After a few weeks your results become available and they are really nicely portrayed. You can do one to one matches, one to many matches and actually see which chromosome you match on and how long of a segment matches. It gives you the ability to see exactly what is going on. Because I’ve uploaded both mine and my mother’s results I can tell easily if a match is on my maternal or paternal side. I really like the system. Contact with potential cousins is through regular email so it is easy to keep track of correspondence with people on different systems. More recently I have had several matches with people on my unknown father’s side. The wonderful people have shared their trees with me and I will try bringing their information into my “Notional Tree” as cousins in a potential relationship. We’ll see what it may find. I think that in the end, DNA is a helpful tool. It has the potential to break down some brick walls, like it did for my Blackhurst tree. However, it is not likely to magically solve a problem or give answers to difficult questions. In my opinion, the best system I’ve used for analysis of autosomal data has been GEDMatch. I really like what they are doing. I noticed that today their website is down due to a server failure. That is really sad. Once their system is back up I will definitely send them a donation to help them keep their system operational. Because GEDMatch doesn’t test themselves, rather they allow you to upload from many different testing results, it really doesn’t matter which of the many autosomal DNA testing companies you use. I think that MyFTDNA has been the best for Y-DNA. My mother and I received the results of our 23 & Me autosomal testing. My mother’s closest match, according to 23 & Me, is a second-third cousin with whom she shares 2.30%, 11 segments. I contacted the individual. We quickly determined that our common ancestors were Henry & Marion (Sanford) Brown and that our great-grandfathers were brothers. Arthur and Clifford Brown. It was very interesting to learn that my grandfather’s birth name was the same first name as her great-grandfather. Also, one of her g-grandfather’s children was named William Sanford Brown, clearly honoring Marion Sanford Brown’s family. It was also interesting to note that both brothers homesteaded land in Kidder County, North Dakota about the same time. My g-grandfather left North Dakota and returned to Minnesota about 1917. It appears that her g-grand father left North Dakota and returned to Minnesota between 1935 and 1940. He then moved out to Eugene Oregon, about 1949, and remained there until his death in 1958. She also sent a wonderful newspaper clipping from 1954 where her great-grandparents celebrated their 60th wedding anniversary. She also sent a wonderful photo of the family. I’ve extracted their faces and will be applying them to my Brown/Montran family tree on Ancestry. It was great to add additional information regarding this line of Browns. It has been quite a while since I last blogged here. I have many other projects and activities going on. First, I was in Minnesota visiting my mother. I put together many questions and recorded about 4 hours of material, about one hour per session four of the 11 days I was there. I have a project to transcribe the information there and include in my personal tree. I subscribe to many genealogy blogs. One of them is the “Search Tip of the Day – Almost Every Day.” Michael John Neill’s May 31st blog reminded me about the Virginia Memory site, which is wonderful. He reminded me of the Chancery records there. There are over 220,000 cases indexed in the Chancery database and nearly 5.6 million images of Chancery causes available online. I’m back working on the Howell line, so I thought; I’ve got a couple difficult research areas. I’ll see if maybe I can find something in the Chancery records. 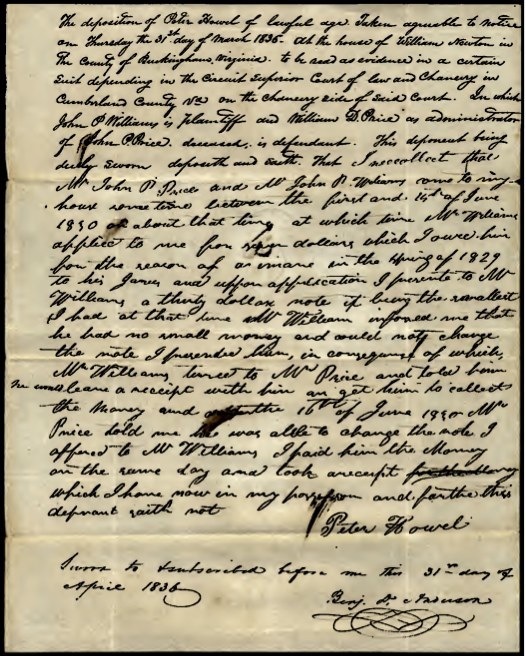 A quick search for Howell yielded a case between JOHN P WILLIAMS and the administrator of the JOHN P PRICE estate. The case involves 90 pages of documents including a deposition by Peter Howell. It is always wonderful to find a document in an ancestor’s own hand with a signature. His deposition didn’t tell me anything new; Peter lived in Buckingham County in both 1830 (date of the event he wrote about) and 1938 (date of the litigation). However, it does indicate he knew both John Williams and John Price, which may be useful later. There are also many references to Mrs. Pankey who is probably Peter’s wife’s mother; (her father died about 1829). There are also several references to Holman/Holeman. Peter’s half sister married a Holman about 1819-1820 and there are several Holman’s in Cumberland County during that period. I still need to go through all the documents with a fine tooth comb and see what I can find out about Holman’s as possible. The database includes so many records for Howell, Pankey, and Holman that I should eventually be able to make some new determinations and connections. Just the Chancery records at the Virginia Memory site should keep me busy for days.